⚠️ Updates to your Full name will be reflected within your Developer Story and/or all Stack Overflow Teams. Within Developer Story, your name is seen by employers and visitors to your public CV/Story. Within Stack Overflow for Teams, your name is seen by members of that team. This warning isn't actually accurate. Having saved my profile like this, my new full name of “test name” hasn't been reflected anywhere I can see on my developer story. It still lists a display name I chose earlier, and my actual full name chosen earlier. Something about that warning isn't quite right and ought to get updated. FWIW though, I consider the fact this doesn't update my full name on my developer story to be a feature. 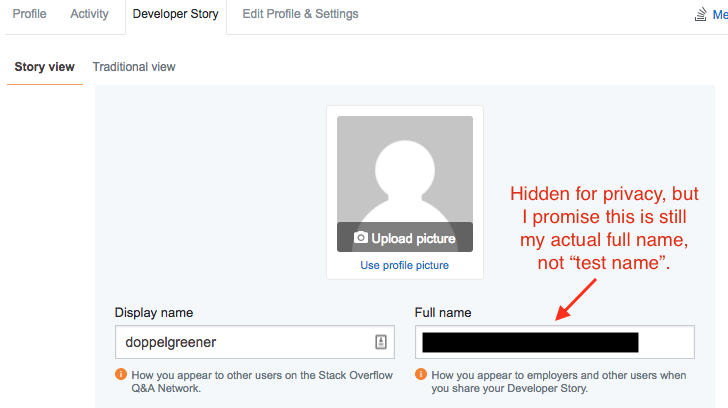 I don't want the full name on my profile, and my full name on my developer story, to overlap — because the full name I choose on my profile is also a public-facing channels name, and I don't want that to be my real life name. On that account I consider the bug to be better resolved by updating the warning. Browse other questions tagged bug profile-page developer-story .